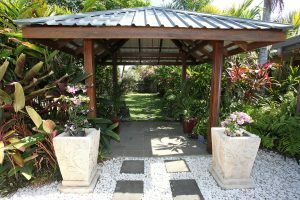 Manta Ray Bed and Breakfast is a small, private resort style getaway offering deluxe, accommodation at secluded Newell Beach in Far North Queensland. Tables and chairs are provided outside each guestroom. A day bed is situated on the Bali Bale overlooking the pool and is a perfect place to relax and curl up with a book while dipping in and out of the pool to refresh. 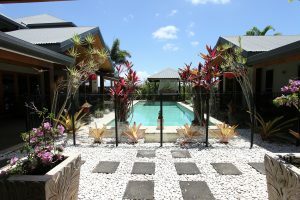 At the rear of the accommodation are cane fields stretching to rainforest covered mountains and beautiful, pristine, white sanded and palm fringed Newell Beach is just a two minute stroll from the back gate, where sea eagles can be seen and if you are lucky you may see the resident Mantaray, the inspiration for our name. Internet access is free and available. Manta Ray has been operating for approx. 12 years now hosting many guests from all over Australia and the world. We are a Council registered B&B subject to inspections, so you can be guaranteed that our standards are high.